With our liveaboard diving vessel the M/V Colona VI, you will experience some of the best diving locations that the Andaman Sea has to offfer. Our locations include; the Phi Phi Islands , Similan Islands , Ko Bon, Ko Tachai, and Richelieu Rock for 4 days and 4 nights, and Hin Daeng & Hin Muang with the Phi Phi Island for 2 days and 2 nights on a weekly departure schedule. Both trips can be combined to give you 6 days and 6 nights on board, giving you the best diving that the undersea world has to offer. 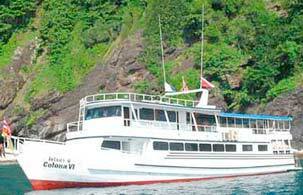 M/V Colona VI accommodates for a maximum of 14 customers. Our extremely comfortable vessel has been running smoothly since her first operation, and proves to be very popular with our repeat customers. Each cabin has two comfortable beds, a large panoramic window, A/C, minibar, private toilet and shower. All sofas and are covered with cushions so you can relax comfortably and recharge for the next dive. The rear of the upper deck has been designed as a shaded area where you can use the cushions provided to lay down, take a rest, read a book. There is a huge 50 square meters sundeck guaranteed plenty of space for everybody. Colona VI also comes complete with a T.V and DVD / Music player. Our hard working crew have been working together for a number of seasons and still enjoy a passion for diving. Comfort, Safety and Fun is our theme for your relaxed liveaboard vacation.